Proteins provide the necessary building blocks for growth and repairing cells like those in your muscles, skin, and nails. Protein not only has a role in keeping your body healthy, but it is also nutritionally satisfying and filling which can aid in weight management. Getting enough in your diet by incorporating a variety of protein foods can be beneficial to your health. 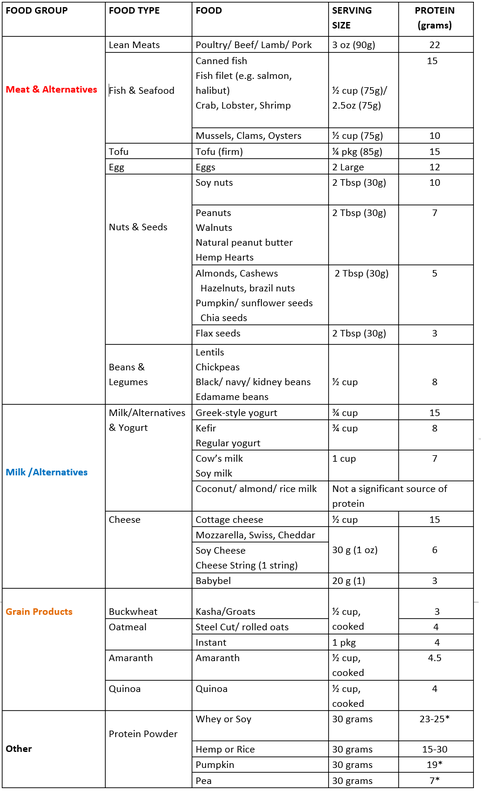 Vary your protein food choices - Eat a variety of foods rich in protein each week. Experiment with main dishes made with beans or peas, nuts, soy, and seafood. Choose seafood or fish twice per week - Eat seafood in place of meat or poultry twice a week. Select a variety of seafood—include some that are higher in oils and low in mercury, such as salmon, trout, and herring. Choose and prepare lean meat and poultry - Choose lean or low-fat cuts of meat like round or sirloin and ground beef that is at least 90% lean. Trim or drain fat from meat and remove poultry skin. Eat plant protein foods more often -Try beans and peas (kidney, pinto, black, or white beans; split peas; chickpeas; hummus), soy products (tofu, tempeh, veggie burgers), nuts, and seeds. They are naturally low in saturated fat and high in fibre. Nuts and Seeds - Choose unsalted nuts or seeds as a snack, on salads, or in main dishes to replace meat or poultry. Nuts and seeds are a concentrated source of calories, so keep your portions in check (1 serving = ¼ cup or 2 Tbsp). Aim to fill ¼ of your plate full of lean protein. Health Canada recommends that adults over 19 years of age eat a minimum of 0.8 grams of protein per kilogram of body weight per day, but protein needs can be very individual. For example, athletes, children, and breastfeeding and pregnant women may have different needs. Consult your dietitian to help determine your protein needs.